I used to live with a great magician. He did magic tricks for parties, and for impromptu gatherings we’d have around the house. When guests would clamor to learn how he tricked them so well, he always declined to answer, saying to do so would violate The Magician’s Oath. The Oath, which was introduced over 2,400 years ago by the Greek Father of modern magic, Charlatates, was an agreement among magicians not to divulge the secrets of their trade, a way to collectively protect their art and in many cases their livelihood. 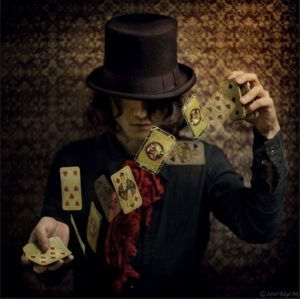 Even though my friend never told me how he did his tricks, by virtue of proximity and repetition, I was able to figure out a few of the sleight of hand moves he made. I realized first and foremost that to unpack the trick, I had to stop looking at what he was showing me, and instead look for what he was doing while I was distracted by his show. Thirty years later I’m reminded of these sleight of hand techniques as I sit in the airport terminal on my way home from visiting with my daughter, reading headlines that proclaim a strong economy, a stock market boom (prior to the recent Dow Jones drop), and the value of the dollar at an all time high. I start to wonder, if this man had been alive during the Depression of 1929, would he remember the “booming economy” that preceded that fall? Then again, he is old enough to remember the boom that preceded the tech bubble that burst in 2000, and the boom that preceded the housing collapse in 2008. Come to think of it, I can’t recall a single financial collapse that wasn’t preceded by an inflated bubble. So why is the pattern so elusive? My memory catapults back to my years with the magician, and how easy it was for me to be mesmerized by his skillful sleight of hand. If it were just the entertainment of magic, I’d happily stay quiet and not bother with the awkward conversation likely to ensue if I venture to keep this conversation going. But I feel sad about how many people get screwed in these collapses, how the whole boom and bust cycle that we’re entrenched in seems to be a calculated “pump and dump” scheme of which this nice man and millions of others are going to bear the brunt. He suggests we look it up on our smart phones, to get a “real” definition. In this scenario, you make money on the way up, and on the way down. The pumping up creates a bubble that bursts when the stocks are dumped onto the market. ** Short selling is the sale of a security that is not owned by the seller, or that the seller has borrowed. Short selling is motivated by the belief that a security’s price will decline, enabling it to be bought back at a lower price to make a profit. Again it’s not just a belief if you can control it — it’s insider betting. What’s the evidence that we’re in the midst of a pump and dump cycle? Despite all the “Quantitative Easing” (printing money, the pump part of currency pump and dump) and low interest rates, there is no substantive indicator that the dollar has any value other than what the Federal Reserve simply says it has. A strong economy? The actual purchasing power of the U.S. dollar has declined by 98% in the 102 years since the Federal Reserve was established. So what are substantive indicators we can look at to determine what kind of shape the economy really is in? How about jobs? 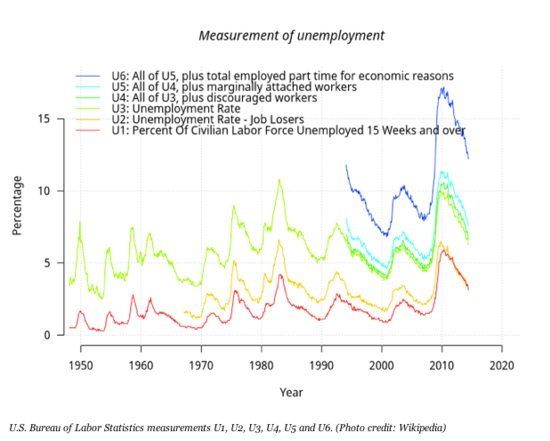 Unemployment as it’s currently reported is completely skewed. What now qualifies as unemployment has been redefined so that official statistics exclude people not actively on record for seeking jobs in the past four weeks (termed “marginally attached” to the labor force). Official statistics also exclude those “employed part time for economic reasons” which means those who need to work full time to make it but who are unable to find full time employment. When these functionally un-and-under employed people are counted, the unemployment rate is closer to 10.3%, more than double the 5.1% the U.S. Bureau of Labor Statistics would have us believe. Manufacturing is also down. The ratio of wholesale inventories to sales in the United States just hit the highest level since the last recession. What that means is that there is a lot of manufactured stuff sitting in warehouses that can’t be sold because people are buying less. As a CNN article explained, approximately one-third of all U.S. households are living “hand-to-mouth”. So jobs, manufacturing, and spending are all down. Even subprime lending is making a comeback. That’s the practice of making loans to people who are high risk — and not as likely to be able to pay them back. The New York Times’ Deal Book estimated that 27 percent of the auto loans issued in 2013 were subprime. And it’s also making its way back into the mortgage business. Wells Fargo is now once again making subprime home loans. Major global trade is bypassing the U.S. dollar for the first time since the dollar was established as the global reserve currency after the Bretton Woods agreement in 1944. Russia and China now do their deals—including oil trades—without the dollar, and it is the same with South Korea and Japan. The UK joined the Asian Infrastructure Investment Bank (AIIB) despite the U.S. “telling” them not to, as did 57 other countries. These moves both strengthen China’s global power and communicate a widespread lack of confidence in the dollar and U.S. primacy. Rigging everything from gold and silver markets to currencies is no longer the domain of conspiracy theories; it’s been documented and reported by many sources, although usually described as the result of isolated incidents. Even George Soros predicts an economic crash, if tracking his investments shows any indication of his confidence. According to SEC filings, he has lowered his investments in all stocks by billions and bolstered his holdings of gold. Speaking of gold, how are other countries relating to it? China, Brazil, Russia, India, and South Africa are all basing their economies on gold. 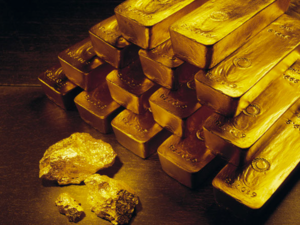 The U.S. is not, and has failed to demonstrate that it even has much physical gold left. When Germany’s central bank tried to repatriate their 300 tons of gold from where it was supposedly stored in Manhattan, they came away with 5 tons and no visible proof that the rest was anywhere to be found. Needless to say, this prompted renewed questions on whether Germany's gold still exists in those Manhattan vaults or if it has been melted down, leased, or even sold. Does all this prove that we are headed for a collapse? No, all this doesn’t prove we are headed for a collapse. But it is a sure indication to me that there is some pumping up going on — of our bonds, our currency, our self-proclaimed international primacy, and our national self-image. And historically speaking, when there’s a pump, there’s a dump. I’m certainly not alone in my concern. Nearly every financial forecaster who saw the 2008 collapse coming is predicting one now. Some of their links are attached below. What’s the best thing to do in the face of such instability? Je vivais avec un grand magicien. Il a fait des tours de magie pour les fêtes, et pour les réunions impromptues nous aurions autour de la maison. 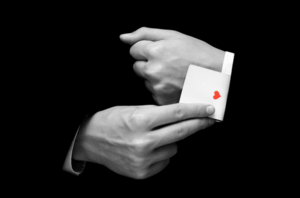 Lorsque les clients se réclamer d’apprendre comment il les a trompés si bien, il a toujours refusé de répondre, disant que cela violerait le serment de The Magician. Le serment, qui a été introduit il ya plus de 2400 ans par le Père grec de la magie moderne, Charlatates, était un accord entre les magiciens ne pas divulguer les secrets de leur métier, un moyen de protéger collectivement leur art et dans de nombreux cas, leur gagne-pain. Même si mon ami ne m’a jamais dit comment il a fait ses tours, en vertu de la proximité et de la répétition, je suis en mesure de comprendre un peu de la tour de main se déplace il a fait. Je me suis rendu tout d’abord que pour décompresser le truc, je devais arrêter de regarder ce qu’il me montrait, et au lieu de chercher ce qu’il faisait pendant que je suis distrait par son spectacle. Trente ans plus tard, je me souviens de ces tours de passe des techniques de main que je suis assis dans le terminal de l’aéroport sur le chemin du retour d’une visite avec ma fille, la lecture des journaux qui proclament une économie forte, un boom du marché boursier (avant la récente chute du Dow Jones), et la valeur du dollar à un niveau record. Je commence à me demander, si cet homme avait été en vie pendant la Grande Dépression de 1929, aurait-il rappeler le “boom économique” qui a précédé cette chute? Là encore, il est assez vieux pour se rappeler le boom qui a précédé la bulle technologique qui a éclaté en 2000, et le boom qui a précédé l’effondrement de l’immobilier en 2008. Venez pour penser à lui, je ne me souviens pas d’un seul effondrement financier qui n’t précédée d’une bulle gonflée. Alors, pourquoi est le modèle si insaisissable? Ma mémoire catapulte revenir à mes années avec le magicien, et combien il était facile pour moi d’être hypnotisé par sa prestidigitation habile de la main. Si il n’y avait que le divertissement de la magie, je serais heureux de rester calme et vous embêtez pas avec la conversation maladroite susceptible d’être causé si je me permets de garder cette conversation. Mais je me sens triste à propos de combien de personnes se faire défoncer dans ces effondrements, comment l’ensemble du cycle d’expansion et de récession que nous sommes ancrés dans semble être un «pump and dump» calculé schéma de laquelle ce brave homme et des millions d’autres vont supporter le poids. Il suggère que nous regardons vers le haut sur nos téléphones intelligents, pour obtenir une définition de «réel». «Pump and dump» est une forme de fraude qui consiste à gonfler artificiellement le prix d’un stock détenue par des déclarations fausses et trompeuses positives, afin de vendre le stock bon marché acheté à un prix supérieur. Une fois que les opérateurs du régime “dump” de vendre leurs actions surévaluées, le prix tombe et tout, mais les investisseurs initiaux perdent leur argent. Dans ce scénario, vous faire de l’argent sur le chemin, et sur le chemin vers le bas. La pompe ing jusqu’à crée une bulle qui éclate lorsque les stocks sont dépotoir ed sur le marché. ** La vente à découvert est la vente d’un titre qui ne soit pas détenue par le vendeur ou que le vendeur a emprunté. La vente à découvert est motivée par la conviction que le prix d’une sécurité va diminuer, ce qui lui permet d’être rachetée à un prix inférieur pour faire un profit. Là encore, il est non seulement une croyance si vous pouvez le contrôler — il est initié paris. «Pump and dump» gagne de l’argent sur la création et l’éclatement des bulles financières. Selon mes recherches, cette pratique est non seulement juridique, il est endémique. Et cette manipulation est non seulement se passe avec les stocks, il se passe dans toutes sortes de marchés, y compris avec les monnaies elles-mêmes. Pendant ce temps, la tromperie économique de la main bobines dans un grand nombre de croyants, au péril de leur fonds de retraite, leurs maisons et leurs vies. Quelle est la preuve que nous sommes au milieu d’un cycle de pump and dump? Malgré tout le «quantitative easing» (imprimer de l’argent, la partie de la pompe de la pompe de la monnaie et dump) et les taux d’intérêt bas, il n’y a pas d’indicateur de fond que le dollar a une valeur autre que ce que la Réserve fédérale dit simplement qu’il a. Une économie forte? Le pouvoir d’achat réel du dollar américain a diminué de 98% dans les 102 ans depuis que la Réserve fédérale a été créé. Alors, quels sont les indicateurs de fond nous pouvons regarder pour déterminer quel genre de forme de l’économie est vraiment dans? Que diriez-vous d’emplois? Le taux de chômage tel qu’il est actuellement indiqué est complètement faussée. Ce qui qualifie maintenant comme le chômage a été redéfini afin que les statistiques officielles excluent les gens de ne pas activement à la recherche d’emplois record dans les quatre dernières semaines (appelé «marginalement attachée» à la main-d’œuvre). Les statistiques officielles excluent également les «Occupé à temps partiel pour des raisons économiques», qui signifie ceux qui ont besoin de travailler à plein temps pour le faire, mais qui sont incapables de trouver un emploi à temps plein. Quand ces gens fonctionnellement ONU-et-sous-employés sont comptés, le taux de chômage est plus proche de 10,3%, plus du double du 5,1% le US Bureau of Labor Statistics voudrait nous faire croire. Le secteur manufacturier est également en baisse. Le ratio des stocks aux ventes en gros aux États-Unis vient de frapper le plus haut niveau depuis la dernière récession. Ce que cela signifie est que il ya beaucoup de choses fabriqué assis dans les entrepôts qui ne peuvent être vendus parce que les gens achètent moins. Comme un article de CNN a expliqué, environ un tiers de tous les ménages américains vivent «main-à-bouche». Donc emplois, la fabrication, et les dépenses sont tous en baisse. Même les prêts subprime est de retour. Voilà la pratique de faire des prêts à des gens qui sont à risque élevé — Et non plus susceptibles d’être en mesure de les rembourser pacte livre de Le New York Times estime que 27 pour cent des prêts automobiles émises en 2013 étaient des subprimes. Et il est aussi de faire son chemin dans l’entreprise de prêt hypothécaire. Wells Fargo est maintenant une fois de plus fait des prêts immobiliers subprime. Major commerce mondial est en contournant le dollar américain pour la première fois depuis que le dollar a été établie comme la monnaie de réserve mondiale après l’accord de Bretton Woods en 1944. Russie et la Chine font maintenant leurs offres, y compris les métiers, sans le dollar pétrole, et il est le même avec la Corée du Sud et le Japon. Le Royaume-Uni rejoint l’Infrastructure Banque asiatique d’investissement (AIIB) en dépit de la US “raconter” leur de ne pas, tout comme 57 autres pays. Ces mouvements à la fois de renforcer la puissance globale de la Chine et de communiquer un manque généralisé de confiance dans le dollar US et de la primauté. Gréement tout sur les marchés de l’or et d’argent aux monnaies ne sont plus le domaine des théories du complot; il a été documenté et rapporté par de nombreuses sources, bien que généralement décrit comme le résultat d’incidents isolés. Même George Soros prédit une crise économique, si le suivi de ses investissements montre une indication de sa confiance. Selon auprès de la SEC, il a réduit ses investissements dans tous les stocks par des milliards et renforcé ses avoirs en or. Parlant de l’or, comment font les autres pays relative à l’informatique? Chine, le Brésil, la Russie, l’Inde et l’Afrique du Sud sont tous basé leurs économies sur l’or. Les États-Unis l’est pas, et n’a pas réussi à démontrer qu’il a même quantité d’or physique gauche. Lorsque la banque centrale allemande a essayé de rapatrier leurs 300 tonnes d’or, d’où il aurait été stocké dans Manhattan, ils sont repartis avec 5 tonnes et aucune preuve visible que le reste était partout à trouver. Inutile de dire, ce qui a incité regain de questions sur si l’or de l’Allemagne existe encore dans les voûtes de Manhattan ou si elle a été fondue, loué ou même vendu. Il semble que, comme pour moi. Est-ce que tout cela prouve que nous nous dirigeons vers un effondrement? Non, tout cela ne prouve pas que nous nous dirigeons vers un effondrement. Mais il est une indication sûre pour moi qu’il ya une certaine pompage en cours — de nos obligations, notre monnaie, notre primauté internationale auto-proclamé, et notre image de soi nationale. Et historiquement parlant, quand il ya une pompe, il ya une décharge. Je ne suis certainement pas le seul à ma préoccupation. Presque tous les prévisionnistes financière qui a vu l’effondrement à venir 2008 prédit un maintenant. Certains de leurs liens sont attachés ci-dessous. Quelle est la meilleure chose à faire face à une telle instabilité? Morgan and Rockefeller: John Kenneth Galbraith. The Great Crash, 1929 . New York: Houghton Mifflin, 2009. Ellen Brown. Web of Debt .